The last note to friends was about PQ and CQ—passion quotient and curiosity quotient. 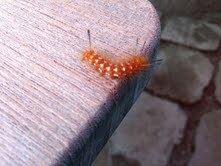 The little furry caterpillar accompanying that note (he was on the table at lunch and I took his picture!) seemed to suggest nature’s version of curiosity. A living thing holding on to the edge of the table, still wiggling to see more, reaching further. Extending himself. But then I was reminded of a line from Mark Nepo’s poem, The Appointment: “Soon you arrive at the edge of all your plans.” The caterpillar seems to have arrived there. The little furry fellow, hanging out in space, reminded me of what it is like to reach the edge of our solid known world. As if we were Columbus in our own life, and arrived at the edge of our known universe. Most of us have been there. At one time or another. Sometimes that happens because of an unexpected opportunity—for me that happened when I got a summer job as a Pan Am International flight attendant to put myself through college. Or it may come with a crushing loss. Or a great set-back—for me that was when I got fired in my 40’s. Or a great turning in life, when suddenly we go in a new direction. 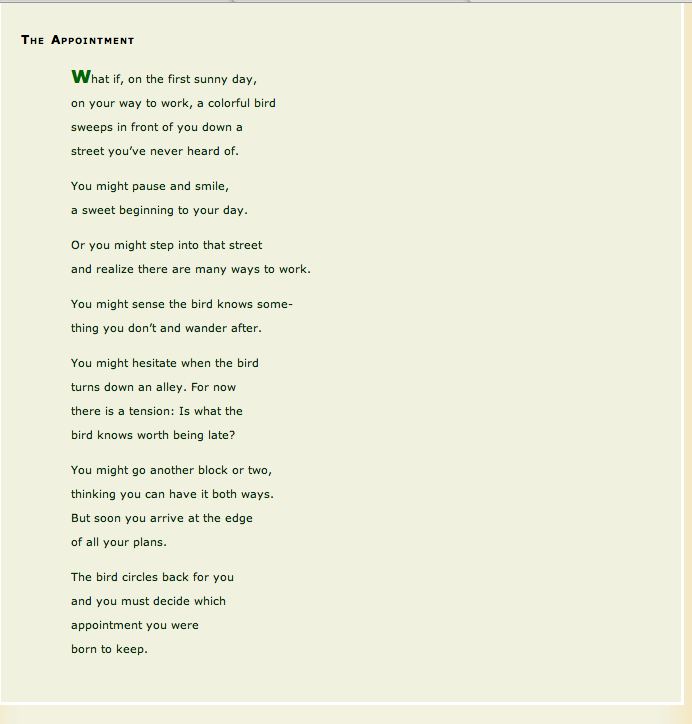 Then like the caterpillar in the picture, we have come to the edge, much as Mark’s poem says. You arrive there as if “the edge of all your plans” is some place, some destination--like Atlanta or Sacramento. Some place the airplane of your life has been diverted to because of unexpected weather. And perhaps he is right about that it being an arriving—it is a place, a destination. A place one might even settle. The edge of all our plans. Maybe it even has its own zipcode. Someone asked me recently, “What’s your relationship with the unknown?” The unknown probably has that same zip code as “the edge of all our plans”. It is a great question What is my relationship with the unknown? With uncertainty? Do I fear it? Am I curious about it? Do I try to get through it as fast as I can? To get out the other side to some certainty? Do I see it as a place to learn? To stretch? Could I live there? Once when I had certainly come to the edge, and beyond, of all my plans, of my known universe, I was complaining to my friend Michael Jones that I was in a swamp. A bog. “Would it help if you thought of it as a ‘wetland’” he asked me. Stopped me in my tracks. When I was growing up in Leelanau County in northern Michigan, swamps were to be avoided at all costs. You didn’t build near them, and you certainly stayed out of them. Slogging through them was not a good idea. Heaven only knew what was in the Cedar Swamp back home. But we know more now, and we treasure swamps and wetlands for their power to moderate and cleanse; for their power to harbor surprising life. And remarkably the Cedar Swamp back home is now part of a large Leelanau Conservancy holding valued precisely because it harbors life. Maybe the territory we find when we arrive at the edge of all our plans is that kind of place. A place of growth, of surprising life. Something to preserve Something to enjoy. Something to treasure. Or in the case of the Cedar swamp, a great place to kayak.